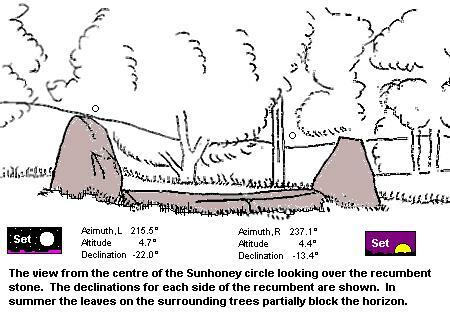 Sunhoney - a description of the Sunhoney recumbent stone circle and its astronomical significance. How to find : Travel thirteen miles west of Aberdeen on the B9119, and north up the farm track at Sunhoney farm. The circle is on the crest of a low wooded hill just west of the farm. Best time of year to visit : Summer minor standstill moon (see dates). Winter sunset, late January / early February; and early November. This beautiful site is one of the best surviving examples of a class of monument specific to the north-east of Scotland, and called 'recumbent stone circles'. These sites are characterised by graduated rings of stones, with the largest ones usually in the south-west quadrant. 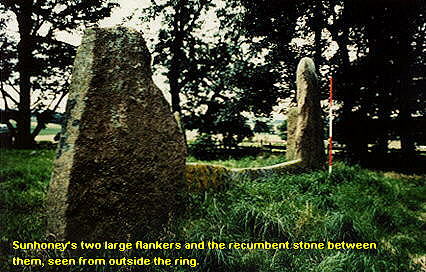 Between the two largest upright stones is one recumbent, usually a huge flat-topped boulder. Within the circles are circular cairns of stones or earth which vary in size from site to site. At Sunhoney this inner ring cairn is very low. The centre was excavated in the middle of the 19th century, when a few deposits of burnt bone were found. Some of the Sunhoney circle stones, which are of an attractive red granite, have fallen and been re-erected in the past. Any visitor to the site will immediately notice that the flat upper surface of the broken recumbent has been decorated with at least 28 cupmarks. Here is another example of the association of these carvings with an astronomically orientated site. Other examples in this book are at Clava, Corrimony, Nether Largie and Ballymeanoch. Some have suggested that the constellation called the Plough or the Great Bear is pictured by the cupmarks. However, as is well known, the Plough rotates around the Pole and cannot set at all, never mind in the area of horizon defined by the decorated recumbent. From a position in the centre of the circle the large flankers direct an observer's attention unequivocally towards the south-west. The azimuth range for the area of horizon over the recumbent, as seen from the middle of the circle with the recumbent at right angles to the observer, is 215.5° to 237.1°. The horizon is high, from 4.7° to 4.4°. These figures indicate declinations in the range -22.0° to -13.4°. This range covers at least two significant celestial targets. The minor standstill summer moon (declination about -20°) sets over the recumbent. The sun at the halfway point between the autumn equinox and the winter solstice and again at the halfway point between the winter solstice and the spring equinox (about -16°) also sets over the recumbent. These points at a later period in Scotland were the winter Quarter Days. It has to be admitted that the day of these celestial events could not have been determined by the monument, which may have been roughly orientated for the purpose of providing a dramatic setting for evening winter festivals. If this were true, then the astronomical significance of the this recumbent stone circle is in its general south-western orientation, which is matched at many similar sites. Should you wish to visit the site to see a sunset, the sun will set behind the horizon over the recumbent from about 11th January to 13th February and again from 30th October to 3rd December. Another photo of Sunhoney is available here (60k).